The only artist in Tanzania who has succeeded in developing the Lilanga art further is Hendrick Lilanga, the grandson of George Lilanga. Many artists tried, for instance Tomas January and in some extent even the children of George Lilanga Costa and Bernard, but it seems that Hendrick Lilanga has advanced most. No wonder. He joined his grandfather already in 1993. At that time it was only Noel Kapanda, a Tinga Tinga painter who worked together with George Lilanga. George Lilanga draw sketches and Noel Kapanda painted. George Lilanga now got more and more orders and he needed help. The first techniques George Lilanga taught Hendrick were goat skin techniques and water color. Though George Lilanga sketched for Noel Kapanda who then filled color into the paintings he did not need to sketch for Hendrick. He was creative enough to find new designs and soon he replaced his grandfather and started to sketch for Noel Kapanda (after 1995) for Mchimbi (ca after 2003). He also developed new techniques. He saw that his grandfather carved calabash and Hendrick ask himself if he could paint on calabash with oil colors. Later he used even water colors to paint on calabash. He has speeded up the process of paintings on goat skin, he was the one who showed his grandfather how to stretch the canvases on bars. Before they put the canvas on the floor and painted directly on it. Hendrick has also created tales to the paintings and he wrote a story book. He found inspiration in the old Lilanga sketch book and to every sketch he added a story. That book he sold to George Lilanga who has then sold it further to a collector. In 2007 and 2008 he bought an air plane ticket to Austria where he learned the etching graphic. He is one of few artists in Tanzania who masters this technique. He has surprised the Austrian teachers with new idea to use the same background on etchings as Tinga Tinga painters use in Tanzania in oil paintings – sunset background. Another skill Hendrick knows is the calligraphy. Recently he has started to combine the watercolor and oil painting on the canvas and goatskin. He has definitely surpassed George Lilanga in creativity and number of techniques. Out of fear for competition the Lilanga´s children Costa and Bernard denies that Hendrick Lilanga is a grandson of George Lilanga and they have even suggested after their father´s death that Hendrick should stop to use the name Lilanga. Firstborn daughter of George Lilanga is Hendrick´s mother (Josephine Georgi Lilanga). But Hendrick has never seen his father till today. 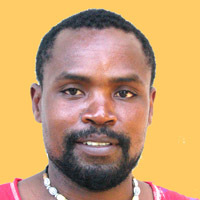 He was born on 20th October 1974 in Dar es Salaam.